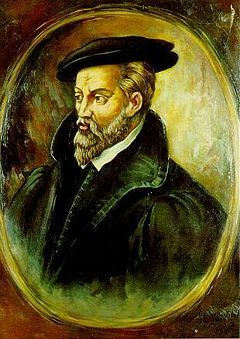 Georgius Agricola (March 24, 1494 – November 21, 1555) was a German scholar and scientist. Known as "the father of mineralogy," he was born at Glauchau in Saxony. He was a pioneer in physical geology and the first to classify minerals scientifically. His most famous work, De re metallica (On the Nature of Metals (Minerals)) (1556), was a standard in metallurgy and mining for over a century and was translated into English in 1912 by Herbert C. Hoover and Lou H. Hoover. His real name was Georg Bauer. Agricola is the Latinized version of his name, Bauer, meaning farmer. Agricola was born 1494, as the second of seven children of a Tuchmacher (weaver) and a Färber (dyer) in Glauchau, Saxony in the present-day far southeast of Germany. Gifted with a precocious intellect, Georg early threw himself into the pursuit of the "new learning," with such effect that at the age of twenty he was appointed Rector extraordinarius of Greek at the so-called Great School of Zwickau, and made his appearance as a writer on philology. After two years he gave up his appointment in order to pursue his studies at Leipzig, where, as rector, he received the support of the professor of classics, Peter Mosellanus (1493–1524), a celebrated humanist of the time, with whom he had already been in correspondence. Here he also devoted himself to the study of medicine, physics, and chemistry. 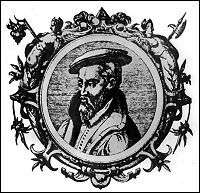 After the death of Mosellanus he went to Italy from 1524 to 1526, where he took his doctor's degree. He returned to Zwickau in 1527, and was chosen as town physician at Joachimsthal, a center of mining and smelting works, his object being partly "to fill in the gaps in the art of healing," partly to test what had been written about mineralogy by careful observation of ores and the methods of their treatment. His thorough grounding in philology and philosophy had accustomed him to systematic thinking, and this enabled him to construct out of his studies and observations of minerals a logical system, which he began to publish in 1528. Agricola's dialogue Bermannus, sive de re metallica dialogus, (1530) the first attempt to reduce to scientific order the knowledge won by practical work, brought Agricola into notice—it contained an approving letter from Erasmus at the beginning of the book. In 1530 Prince Maurice of Saxony appointed him historiographer with an annual allowance, and he migrated to Chemnitz, the center of the mining industry, in order to widen the range of his observations. The citizens showed their appreciation of his learning by appointing him town physician in 1533. In that year, he published a book about Greek and Roman weights and measures, De Mensuis et Ponderibus. He was also elected burgomaster of Chemnitz. His popularity was, however, short-lived. Chemnitz was a violent center of the Protestant movement, while Agricola never wavered in his allegiance to the old religion, and he was forced to resign his office. He now lived apart from the contentious movements of the time, devoting himself wholly to learning. His chief interest was still in mineralogy, but he occupied himself also with medical, mathematical, theological and historical subjects, his chief historical work being the Dominatores Saxonici a prima origine ad hanc aetatem, published at Freiberg. In 1544 he published the De ortu et causis subterraneorum, in which he laid the first foundations of a physical geology, and criticized the theories of the ancients. In 1545 followed the De natura eorum quae effluunt e terra; in 1546 the De veteribus et novis metallis, a comprehensive account of the discovery and occurrence of minerals; in 1548 the De animantibus subterraneis; and in the two following years a number of smaller works on the metals. His most famous work, the De re metallica libri xii, was published in 1556, though apparently finished several years before, since the dedication to the elector and his brother is dated 1550. It is a complete and systematic treatise on mining and metallurgy, illustrated with many fine and interesting woodcuts and containing, in an appendix, the German equivalents for the technical terms used in the Latin text. It long remained a standard work, and marks its author as one of the most accomplished chemists of his time. Believing the black rock of the Schlossberg at Stolpen to be the same as Pliny the Elder's basalt, he applied this name to it, and thus originated a petrological term which has been permanently incorporated in the vocabulary of science. In spite of the early proof that Agricola had given of the tolerance of his own religious attitude, he was not suffered to end his days in peace. He remained to the end a staunch Catholic, though all Chemnitz had gone over to the Lutheran creed, and it is said that his life was ended by a fit of apoplexy brought on by a heated discussion with a Protestant divine. He died in Chemnitz on the 21st of November, 1555—so violent was the theological feeling against him that he was not allowed to be buried in the town to which he had added such lustre. Amidst hostile demonstrations he was carried to Zeitz, some fifty kilometers (30 miles) away, and buried there. De re metallica is considered a classic document of the dawn of metallurgy, unsurpassed for two centuries. In 1912, the Mining Magazine (London) published an English translation. The translation was made by Herbert Hoover, an American mining engineer better known in his term as a President of the United States, and his wife Lou Henry Hoover. More recently, De re metallica has been criticized as an early example of mechanistic reductionism—what the historian Carolyn Merchant calls "the death of nature." As a transitional figure in this movement, Agricola found it necessary to write a long apology for the violation of "Mother Earth" through mining. This page was last modified on 19 June 2017, at 18:16.